I couldn’t wait till I could drive legally. Frankly I wanted to drive regardless. This is an emotion that every teenager in the latter half of the 20th century is very familiar with. One day one of my classmates, Tim Ray, showed me his driver’s permit. He got it in California when he turned 15. I was insanely jealous, and it must have shown, because Tim smiled and gave me his permit. It was a yellow piece of flimsy paper with his name and address, but no photograph. Tim said that if I got stopped I should show them the permit and tell them that my name was Tim Ray. (I later found out that Tim was the son of Nicholas Ray, the famous movie director of ‘Rebel without a Cause’.) Tim went back to the States at the end of the school year and I kept his permit. Fortunately I never had to show it to anybody. I still have that somewhere in a box as a memento. There was a discotheque called the Stereo Club close to our apartment that I used to frequent. One day I was speaking to the owner and he mentioned that his son was coming for Christmas, and he would love for me to meet him. A few weeks later I met his son Ali who looked vaguely familiar. Ali and I quickly became fast friends. One day Ali called me at home and told me to come to the club as he wanted to show me something. I started walking the 2 or 3 blocks to the club and when I turned the corner I found a British Racing Green 1963 E-Type Jaguar convertible parked in front of the club. I was speechless. A few seconds later Ali walked out of the club and saw me standing there admiring his car. “Do you want to take it for a drive?” He asked. “Absolutely!” I answered nervously, hoping that I wouldn’t get stopped by the police. The drive was uneventful as I only drove about 5 or 6 blocks and returned. However, the feeling of power and excitement I felt as I drove from stoplight to stoplight was like a drug running through my system, and I never got over it. Over the rest of the year I had many opportunities to enjoy the Jag. One memorable experience was when I drove the E-Type by the American School of Madrid one afternoon, and I found a couple of girls from my class. I stopped and asked them if they wanted to go for a drive and they jumped right in. Initially they sat on the rolled up soft top with their legs inside the car. One was blonde and the other a brunette. What a sight we must have been driving around Madrid with 2 beautiful women hanging on with long windswept hair streaming behind. Soon I found myself on the outskirts of town on a major 3 lane thoroughfare. I told the girls to get inside as I was going to open her up. Downshift into 3rd. Accelerate, run her up to 5500 RPM, downshift, accelerate and watch the kph speedo. 140, 150, 160, ….220…230…240…..250… and the girls screaming in scary delight brought me back to reality. I had never gone so fast. The ride back was serene as we all digested what we had just felt. One evening Ali gave me the car keys and asked me to get my guitar as he and I were going to jam together in the club. Although I had studied guitar with one of the great teachers in Sevilla, I had never jammed with anyone before. So I was understandably nervous. “Is there anybody at your house?” He asked. 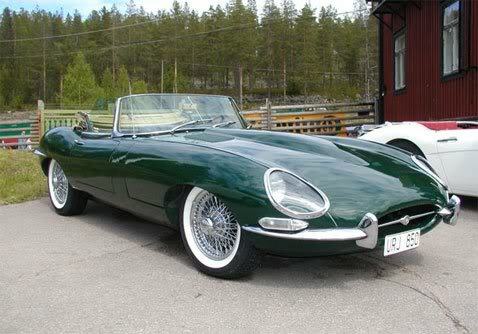 “Invite her to the party.” He said with a smile.I jumped into the E-Type, which was parked outside the front door of the club, and drove the few blocks to our apartment. I was fortunate to have found a parking place just in front of the apartment. I went up, hoping that mom was not home, as I didn’t really want her at the club. “Yes” I answered her, while I fought with myself about inviting her to the club or not. I often socialized with mom, but I already knew most of her friends. This was different, Ali was my friend and I didn’t want to share him, …yet. “It’s early, are you going out again?” She asked from the living room, just as I was passing by. I walked over to my room and grabbed my guitar case. I walked into the living room and kissed my mother on the head. “Yes, I’m going out again. Just wanted to grab my guitar.” I said. “To the club. Ali and I are going to jam a little.” I said. “Oh, I thought you might want to spend a bit of time with your mother. You are always out. I never see you.” She said. “Why don’t you come with me?” Oops. I just invited her. A few minutes later mom and I were walking out the door, and I steered her to the E-Type. “What is this?” Mom asked. “Ali let me borrow it.” I answered. As I pulled out of the parking space and stopped at the light on the corner of our street. I was seriously nervous, this was the first time mom had seen me drive since our ill fated drive in Tangier when I had been 12. The lights turned green and I popped the car into gear and accelerated … right into the little Simca behind us! My foot was already on the clutch, so I quickly repositioned the gear lever into first, and drove away, …till the next light caught us. I didn’t want to look at my mother, I could feel her eyes boring into my head. All of a sudden, the car I hit was behind us and the driver was leaning on the horn. He jumped out of the car and started screaming at me. When the gentleman realized that my mother was Spanish and that he had seriously insulted her, he freaked out. “Let us pay for the damage.” My mother said. 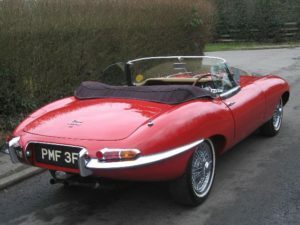 As I looked at his car, I saw that the bumpers on my Jag were at the same height and separation to the headlights of the Simca, and I had taken both of his headlights out with my bumpers! “Let’s go son, we have a party to go to.” Mom said. The rest of the night was an anticlimax. After a couple of drinks I took mom home and returned the Jag to the club. 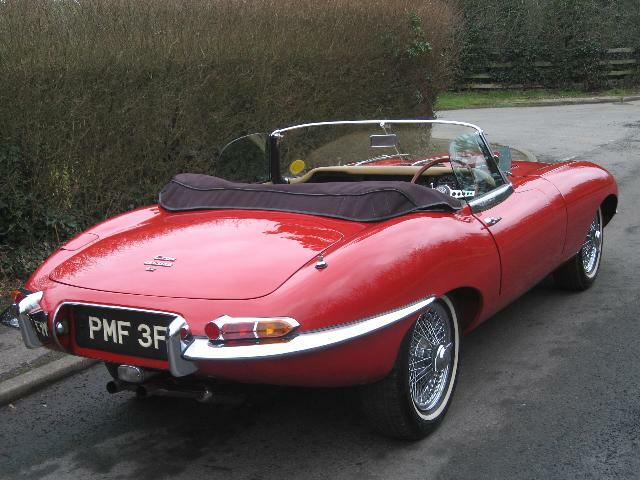 In the 3.8L E-Type, reverse gear was all the way left and forward, very similar to first gear, only not as far left. In later years, they placed reverse to the left and back so this would not happen. One day Ali told me that he had to return to Jordan. The King had summoned him and he would not be back. He took the E-Type with him. I was crushed. I had even gone to the trouble of forging my mother’s international driver’s license. I was concerned that Tim’s flimsy California drivers permit would not get me out of trouble, so I took mom’s license and changed the picture, as well as modifying her name to one sounding vaguely masculine – from Marie-Louise to Mario Luis. 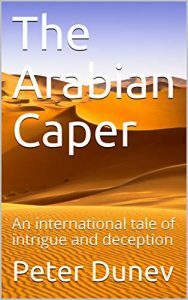 I am really glad I never got stopped, or they would have thrown me in jail and thrown away the keys, the forgery was so embarrassingly crude.